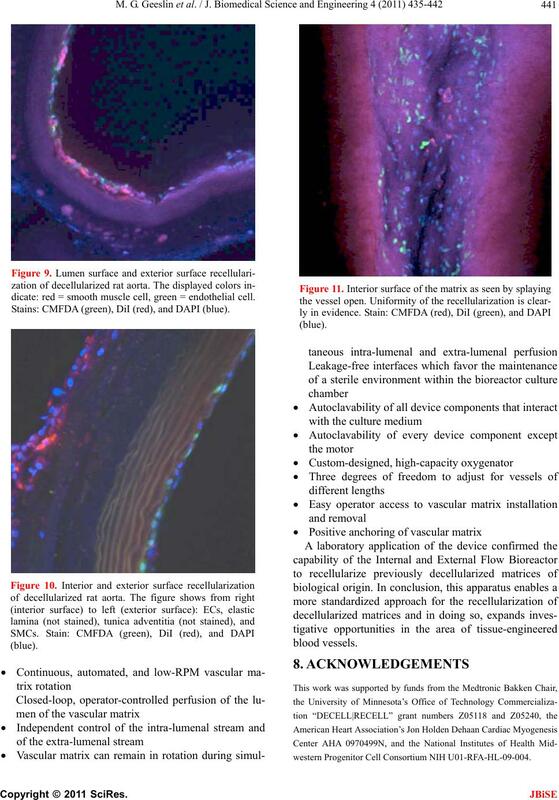 doi:10.4236/jbise.2011.46055 Published Online June 2011 (http://www.SciRP.org/journal/jbise/). 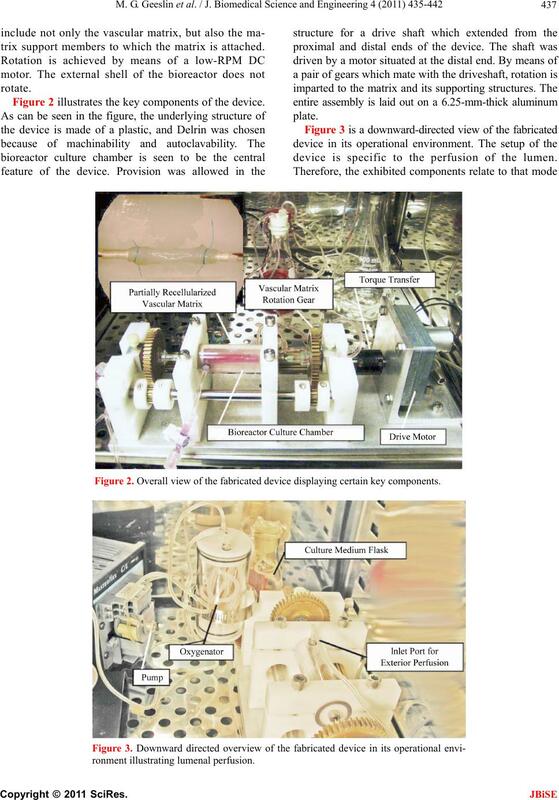 Received 11 April 2011; revised 1 May 2011; accepted 11 May 2011.
mentation of a device for reconstitution is described. also accomplished by the bioreactor described here. arterial replacements in various stages of development. cacy of such a device. trix is separately perfused bo th internally and externally. cuits are independent and have their own auxiliaries. provide flow-rates between 0.06 mL/min and 43 mL/min. Figure 1. Schematic flow diagram of the bioreactor and its auxiliary components. trix support members to which the matrix is attached. 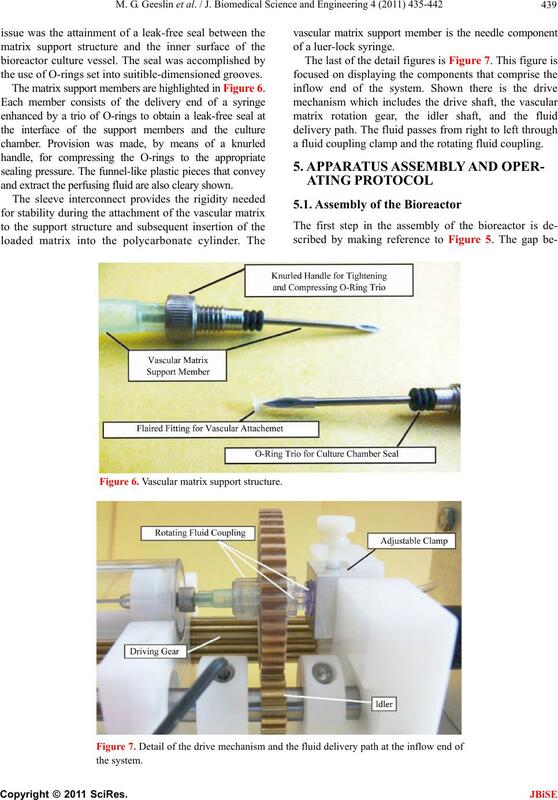 Figure 2 illustrates the key components of the device. 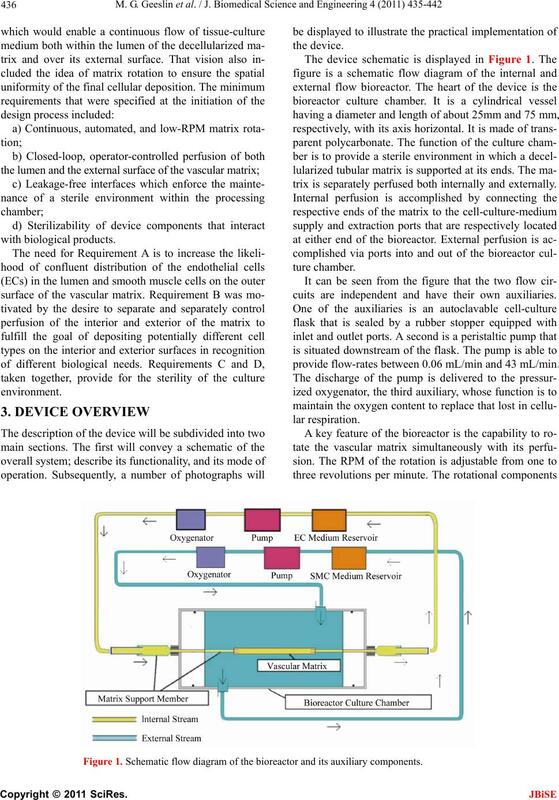 device is specific to the perfusion of the lumen. Figure 2. Overall view of the fabricated device displaying certain key components. the interior and exterior surfaces of the vascular matrix. details will now be displayed. fixtures is the pair of vascular matrix support members. where they are more easily identified. Figure 4. Detail of the bioreactor culture vessel. Figure 5. Disassembled view of the bioreactor culture vessel. the use of O-rings set into suitible-dimensioned grooves. The matrix support members are highlighted in Figur e 6.
and extract the perfusi ng fluid are als o cleary shown. a fluid coupling clamp and the rotating fluid coupling. Figure 6. Vascular matrix support structure. 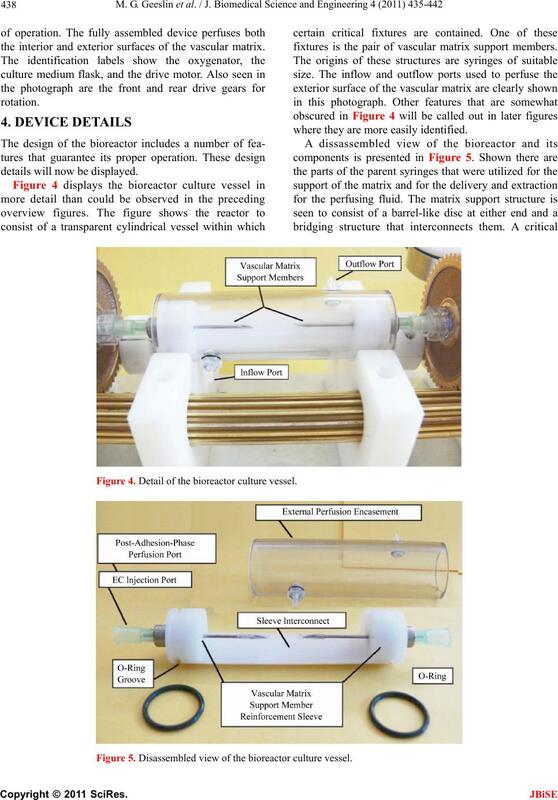 of the flaired polyethylene fitting displayed in Figure 6.
the vascular matrix support member reinforcement sleeve. the ports that are called out in Figure 5.
be seen in Figure 1.
is continued for about eigh t hours and then discon tinued. is passed through the culture vessel as a continuous flow. prior to the stoppage of matrix perfusion and rotation. 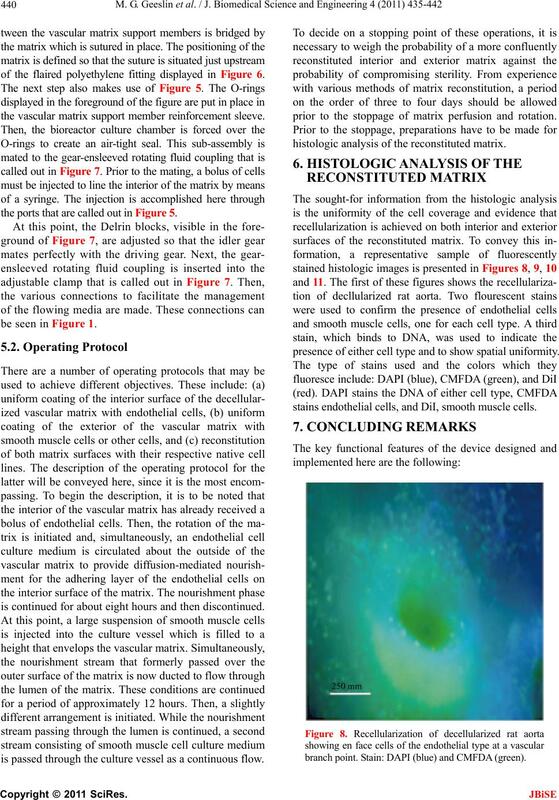 histologic analysis of the reconstituted matrix. presence of either cell type and to show spatial uniformity. stains endothelial cel l s , and D i I, smooth m uscle cell s.
branch point. Stain: DAPI (blue) and CMFDA (green). dicate: red = smooth muscle cell, green = endothelial cell. Stains: CMFDA (green), DiI (red), and DAPI (blue). western Progenitor Cell Consortium NIH U01-RFA-HL-09-004. 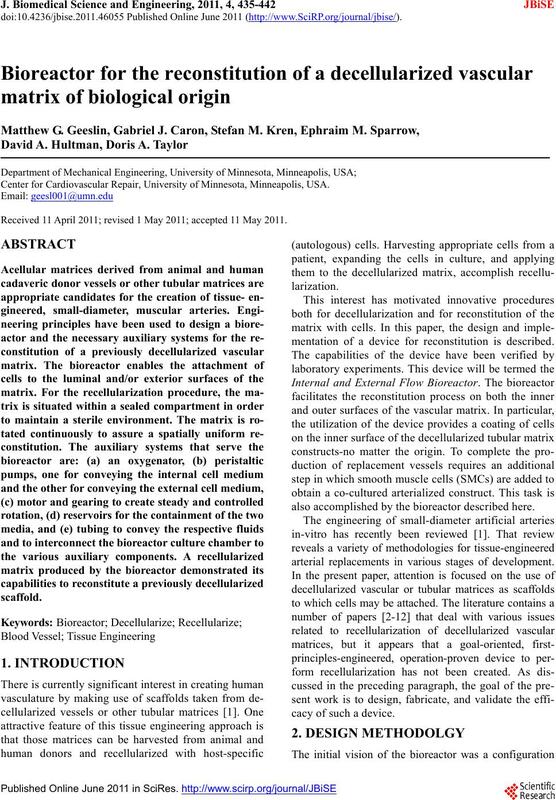 Small-diameter artificial arteries engineered in vitro. Vascular and Endovascular Surgery, 23, 475-485. 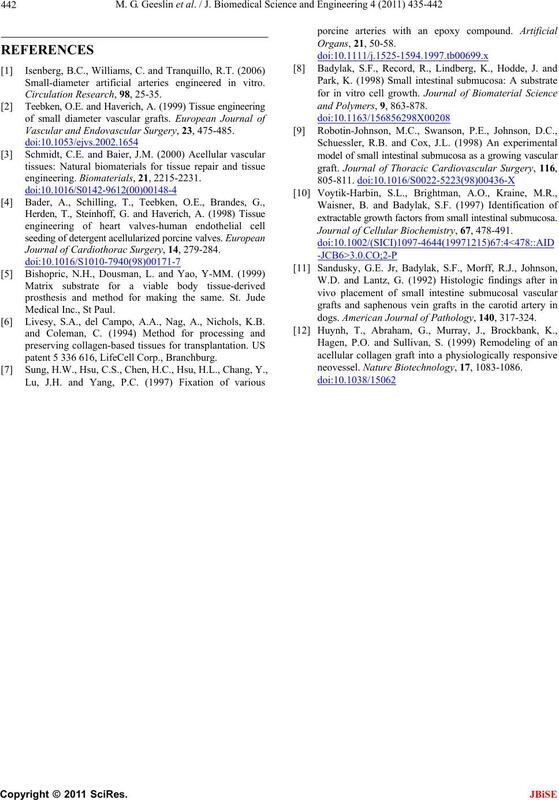 Journal of Cardiothorac Surgery, 14, 279-284. Livesy, S.A., del Campo, A.A., Nag, A., Nichols, K.B. patent 5 336 616, LifeCell Corp., Branchburg. extractable growth factors from small intestinal submucosa. Journal of Cellular Biochemistry, 67, 478-491.
dogs. American Journal of Pathology, 140, 317-324.
neovessel. Nature Biotechnology, 17, 1083-1086.